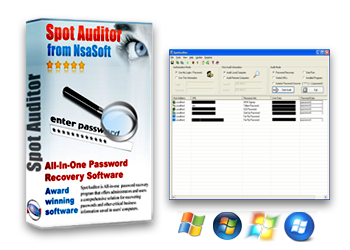 SpotAuditor is an advanced password recovery solution. The software recovers over 40 popular programs passwords, including passwords saved Google Chrome, Internet Explorer, Firefox and Opera browsers, Microsoft Office Outlook smtp and pop passwords, Hotmail password, Facebook password, Gmail password, Yahoo password, Aol password, 20 top FTP program passwords, recovers saved passwords hidden behind of asterisks on dialogs and web forms. SpotAuditor recovers passwords saved in Google Chrome, Microsoft Edge, Internet Explorer, Firefox and Opera browsers. SpotAuditor Asterisk Password Recovery reveals the passwords stored behind the asterisks in password text-boxes, dialog boxes, web pages and ActiveX controls. Whenever a new window containing a password box is opened, Asterisk Password Uncover automatically reveals the password inside the password-box, and add a record to passwords list in the main window of SpotAuditor. SpotAuditor enumerates all Dial up entries on computer and recovers Dialup, RAS and VPN passwords.The passwords are revealed only if you log on to the computer with administrator privileges. Under Windows, select SpotAuditor, right-click and choose "Run as administrator" to recover your passwords. Recovers FileZilla, WS_FTP and over 20 other FTP program passwords.